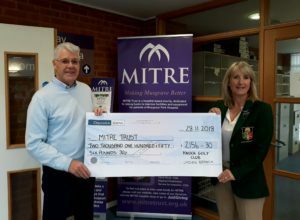 Helen Anderson and the Ladies Branch of Knock Golf Club have been raising funds throughout the year for both the MITRE Trust and Tinylife. Their fundraising has now come to an end, and they presented MITRE with a cheque for £2156.30. MITRE would like to thank Helen and the Ladies section of Knock Golf Club for their very kind donation. It is much appreciated.